One of the wonderful things about living in Evergreen is the smorgasbord of winter activities available in our mountain playgrounds. Just 35 minutes west of downtown Denver on Highway 285 or I70 is the winter wonderland of Evergreen and Conifer Colorado. Evergreen is my home. It's also where I love working as a Realtor. Chilly mornings, powdery snow, friendly Main Street and cozy fireplaces await you. After many requests about snow shoeing this year, I've been researching a couple of spots and found the best location to be near Echo Lake on Squaw Mountain road (Highway 103). This 23 acre park at the foot of Mount Evans is just 20 minutes from either Idaho Springs, or Evergreen, this is a great spot for easy, safe snow shoeing. Lots of cross country skiers use this area. In fact, the trails are reported to be very heavily used because the paths are relatively easy for new and young skiers. Keep in mind that cross country skiers don't need passes or permits for cross country skiing in national forests, so make your own fun. Be safe. The same rules apply for all skiers. Know the signs of an avalanche area, take plenty of water, sun screen, etc. Have you ever tried ice fishing? Colorado Park and Wildlife stocks lakes in late fall, so there are plenty of fish to catch. Evergreen's Bear Lake is a favorite for the ice fisherman where numerous portable shelters are seen from December through February. 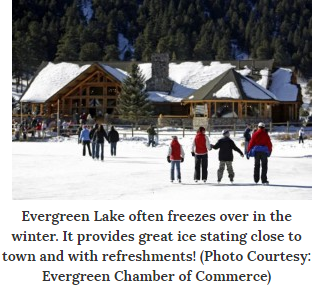 This weekend, December 15-16, Evergreen's Bear Lake opened to the public for ice skating. If you're coming into Colorado from lower altitudes, make arrangements to stay one day in Denver before heading for the hills for extreme winter sports. The jump from sea level to Denver (5280) is a big one, but add another 3000-4000 feet in altitude and you'll be dizzy your first day of skiing without acclimating to dry and high Colorado. When folks are first visiting the mountain suburbs of Denver, I encourage them to try out our mountain amenities. They are testimonials to how we love to live outdoors in both winter and summer. Buying a home here is more than than just buying a place to live. It's investing in a whole outdoor lifestyle. Often, folks from out of state are surprised about the variety of things to do outdoors. Frankly, it is one of the best reasons to live here for me and my family! If you want more information about either outdoor activities or our fabulous mountain homes, just contact me on the form below.